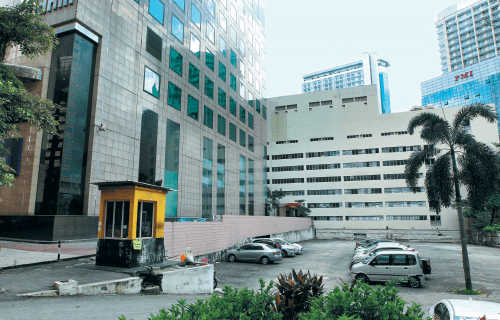 A 0.46-acre freehold commercial parcel between Wisma Goldhill and Wisma MPL in Jalan Raja Chulan, which is currently being used as a car park, is now on the market for about RM71.08 million or RM3,500 per sq ft. If the sale goes through at that price, it will set a new benchmark for Jalan Raja Chulan, say consultants. The parcel is less than 2km from Suria KLCC and 900m from Pavilion Kuala Lumpur. Its exclusive agent is DTZ Malaysia. According to an advertisement placed in the Feb 2 issue of City & Country, the parcel comes with a development order (DO) for a 39-storey tower that can accommodate 136 serviced apartments. Of these, 34 units are 1+1-bedroom types, 100 units are 2-bedroom types and two are penthouses, says DTZ Malaysia managing director Eddy Wong. He adds that the parcel comes with a plot ratio of eight, giving it a gross floor area of 162,472 sq ft and a net lettable area of 111,800 sq ft.
“There is a lot of interest as this site is in a very strategic location, being within walking distance of both Pavilion KL and the Petronas Twin Towers. Usually, you are close to one and not the other,” he tells City & Country. While Wong declines to name the vendors of the site, a search by City & Country shows that the parcel is owned by KLK Development Sdn Bhd. The company is not related to Kuala Lumpur Kepong Bhd, a plantation company with a property development arm. Is the asking price too high? “It’s not really expensive if you consider the fact that the last two transactions in the KLCC area were around RM3,300 psf … We think the potential buyers will be those who don’t want to go through the hassle of getting the necessary planning approvals, which is the appeal of buying with the DO in the first place,” says Wong. In 2013, KSK Group Bhd bought 3.95 acres in Jalan Conlay from Singapore-based developer UOL Group Ltd for RM568 million or RM3,299 psf. The group’s unit, KSK Land Sdn Bhd, is currently developing over 1,000 luxury serviced residences and a hotel, both to be managed by Kempinski, atop a retail podium (see our Cover Story). Last May, Tropicana Corp Bhd sold 3.14 acres in Jalan Bukit Bintang to Offshore Triangle Sdn Bhd — a company jointly owned by Tropicana and Hong Kong-listed developer Agile Property Holdings Ltd on a 30:70 basis — for RM448.4 million cash or RM3,280 psf. The land is earmarked for a mixed-use development. Both parcels did not come with DOs. However, an industry observer says the two transactions took place within Kuala Lumpur city centre, whereas Jalan Raja Chulan falls on the fringe of the area. That said, the parcel is still in the Golden Triangle where opportunities to buy empty parcels are fairly uncommon, he says. It also comes with a DO and a decent plot ratio, he adds. Meanwhile, Henry Butcher Malaysia Sdn Bhd chief operating officer Tang Chee Meng says a notable transaction was the sale of a 3.11-acre parcel in Jalan Ampang by Loke Wan Yat Realty Sdn Bhd to Singapore developer Oxley Group for RM446 million or RM3,300 psf. “Other transactions are of smaller parcels located off Jalan Raja Chulan (in Jalan Bukit Ceylon, Changkat Ceylon and Changkat Raja Chulan), which were done at RM650 psf to as high as RM2,200 psf,” he adds. LaurelCap Sdn Bhd director Stanley Toh, meanwhile, says RM3,500 psf is “on the higher side of the spectrum, taking into account the current property market sentiment”. While he describes the location as “superb”, given that it is within walking distance of major shopping centres and near the much-coveted Bukit Bintang and Jalan Sultan Ismail addresses, he says with a plot ratio of eight, the developer would have to “break the barrier” of serviced apartment prices in KL to make the land cost feasible. “With the land cost at RM3,500 psf, you would probably need to get a plot ratio of 10 and above in order for the project to be viable. Tang, however, feels that the development can be financially viable because Jalan Raja Chulan is a prime location. “However, the developer will have to come out with an extraordinary design and sales package and ensure sales happen at a quick pace as there is little room for error. It will also have to price the units above RM2,000 psf, which will make it more challenging as it will be higher than a nearby project and considering the softer market. The small land size will also pose some design constraints as parking space will have to go up many floors to accommodate the numbers required,” he adds. What is the market like for serviced apartments now? Wong, citing Venus Assets Sdn Bhd’s Four Seasons Place branded residences next to the Petronas Twin Towers and Alpine Return Sdn Bhd’s Star Residences in Jalan Yap Kwan Seng, says the response to both properties was heartening. According to a source familiar with Four Seasons Place, the branded residence’s sales are at 80% since the project was launched in 1Q2013. Typical units have built-ups of 1,098 sq ft to 3,843 sq ft and layouts of 1+1 bedrooms to 4+1 bedrooms. “A mid-size unit recently sold for over RM3,400 psf, the highest price so far,” says the source. Meanwhile, Star Residences’ first phase has achieved 80% sales since it was launched in January last year, says Alpine Return chief operating officer Alan Koh. The first phase comprises 557 units with built-ups of 625 to 722 sq ft, and 1-bedroom and 1+1-bedroom units. They were sold for RM1,600 psf, or between RM1 million and RM1.3 million each. The second phase, which is scheduled to be launched in September, will comprise 482 units with built-ups of 700 to 800 sq ft. These will be sold at RM2,000 to RM2,100 psf, says Koh. Meanwhile, Tang says units with built-ups of 600 to 800 sq ft are easier to sell, whereas the opposite is true for units above 2,000 sq ft.
“Market sentiment is generally softer and speculative activities have declined significantly. End financing is a major issue faced by buyers,” he adds. LaurelCap’s Toh says the National Property Information Centre’s third quarter 2014 residential property stock report shows that the existing stock of serviced apartments in Seksyen 1 to 100 (Jalan Raja Chulan falls under Seksyen 57) stands at 11,203 units, with another 10,305 units under construction and 1,431 units planned. He also observes that the current market is “not the best” one for high-end developments. He adds that the market is still driven by local rather than foreign demand. “Nevertheless, there is a small group of purchasers with interest in high-end serviced residences accompanied by a high-end and branded operator such as Banyan Tree, for example. However, this group is quite limited and this trend has already been tapped by developers. Brands such as Harrods, Kempinski and Jumeirah are some of the operators that will be making their foray into Kuala Lumpur,” he says. So in short, while the Jalan Raja Chulan parcel’s location is fantastic, buyers will need to either come up with an outstanding product and marketing plan, apply for a higher plot ratio or have enough holding power to wait for the next property cycle, say consultants. This article first appeared in City & Country, The Edge Malaysia Weekly, on February 16 - 22, 2015.